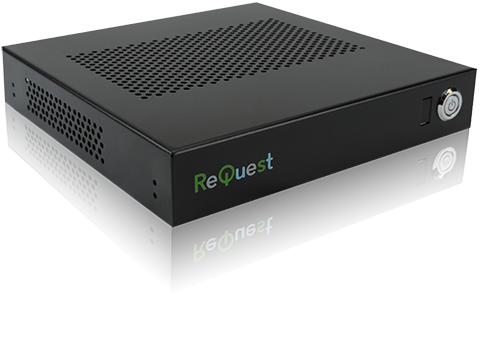 F1 packs all the power of ReQuest's multi-zone Serious Play servers into a compact, single-zone media powerhouse. With the ability to add up to three NAS devices, F1 can handle your entire family's music and movie collection with ease. Looking for the most pristine listening experience available? F1 servers will play HD Audio. Available now at HDTracks.com, 96kHz/24-bit HD Audio brings the most realistic sound and greatest sonic detail available to any music file format. With a fanless chassis and optional solid state hard drive, your music is all you will hear. Adding a MediaPlayer Mini or MediaPlayer Plus brings the true power of F1 to your wide screen hi-def television, playing your archived movie collection of DVDs and Blu-ray discs. The MediaPlayer even acts like another audio zone, allowing you to stream your music collection to your connected home theater system. Whenever you add a new TV or entertainment system, just connect a new MediaPlayer and your entire collection shows up in that room as well! ReQuest MediaPlayers also add an additional audio zone. Note: The F1 does not have a built-in CD drive for archiving or importing CDs. You can use NetSync for iTunes to import music and playlists, or add a USB CD/DVD drive. NEW: Step By Step Walkthrough for F1 and MP Setup!